Introduced to European gardeners in approximately 1900, Prunus 'Shirofugen' is a strong growing, deciduous, wide spreading ornamental cherry tree grown notably for its gorgeous, long lasting blooms. 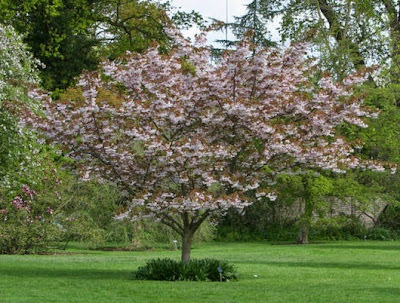 It is believed to have originally be a naturally occurring variety of Prunus serrulata and was originally named by the notable English plant collector Ernest Henry 'Chinese' Wilson as Prunus serrulata forma alborosea. It is considered to be one of the best hybrids for general planting and one of the very last Japanese ornamental cherries to flower. It is a particularly old cultivar having been being cultivated in Japan since the 16th century. It is also known as Fugenzo, meaning ‘Elephant of Fugen’ and refers to the white elephant which represents the Buddhist saint Fugen. It has a characteristic flattened, spreading crown and depending on conditions and culture will growth to a height and spread of between 4-8 meters. On mature specimens the branches hang over strongly and become as wide as high. The young leaves emerge in the spring a deep coppery-brown colour which contrasts superbly with the blooms which appear from mid April to late May. The double flowers are produced in long-stalked clusters and are comparative large for Japanese ornamental cherries opening up to be approximately 5 cm in width. They are dull pink in bud, opening white and fading to purplish pink. Prunus 'Shirofugen' will also provide some reasonable autumn colour with the foliage turning orange before they drop. Prunus 'Shirofugen' will perform best on moist, but well-drained soil in a position of full sun. Poor soils should have organic matter added to the backfill before planting. Avoid planting on waterlogged or permanently wet ground. 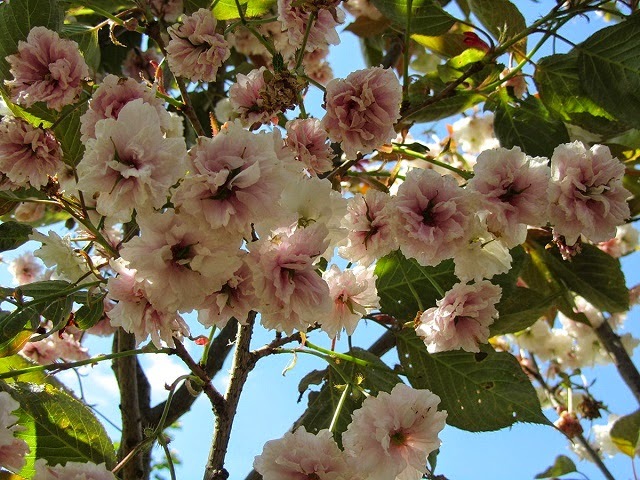 Prunus 'Shirofugen' has been received a couple of awards by the Royal Horticultural Society. The Award of Merit (AM) was given in 1951, while the Award of Garden Merit (AGM) was given in 1984.